According to a study recently published in Proceedings of the National Academy of Sciences (PNAS), the weed-killer known as glyphosate decreases the microorganisms in a honey bee’s guts, and such changes leave the insects much more likely to die an early death. These lost but helpful microorganisms in the guts of honey bees are directly tied to their health, helping them maintain their metabolism, immune system, and weight. These new findings ultimately go against prior claims of glyphosate, which is the active ingredient within Bayer’s Roundup weed-killer, not harming wildlife, and it offers another potential clue regarding why honey bee hives are declining so much. “Gut microbiota are involved in nutrition for bees, helping break down components of cell walls in pollen grains and protecting against different pathogens,” says Nancy Moran, who is the study’s senior author and an evolutionary biologist with the University of Texas. She and her team gathered honey bees by the hundreds from one hive before exposing several individual bees to common glyphosate levels and then returning them to their hive. In three days, the treated bees’ gut bacteria had already decreased. When the treated honey bees were subjected to harmful pathogens, it was far more likely they would die due to reduced gut microbiota. Previously, it was believed glyphosate wasn’t harmful to bees, as it targets a specific enzyme typically found in microorganisms and plants, but gut microbiota in bees also have this enzyme. “It’s true the bee itself has no molecular targets from glyphosate, but its gut bacteria do have targets,” Moran said. “It’s similar to humans taking antibiotics where there can be trouble if you upset the normal microbiota.” Bumblebees have similar microbiota in their guts and are also vulnerable to glyphosate’s effects. In the past decade or so, honey bees have been declining in their population numbers, with researchers pinning the blame in large part on colony collapse disorder, but they don’t yet know the cause of it. Researchers had previously pointed to parasites, diseases, pesticides, habitat loss, and a mix of all these stressors. With glyphosate affecting honey bees as it does, the fact that it’s currently the most commonly used herbicide in the world only makes bee decline even more troubling. 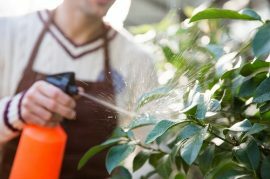 Over 3.5 billion pounds of glyphosate have been used in the United States in the past 40 years, with two-thirds having been applied in the last ten years. Moran says her team’s new study won’t be sufficient evidence to prove glyphosate impacts honey bee population levels, “but there really is a lot of [glyphosate] in both agricultural and urban areas,” Moran said. “At the moment, there are no guidelines that you should avoid spraying glyphosate on or near bees since it’s considered completely innocuous.” Even so, this study is another blow to the popular weed-killer and its potentially harmful side effects.